Much of the French/Italian border is up in the high Alps. And along much of this border are endless high, old, unpaved military “roads.” Often leading to old forts, bunkers, etc. Usually/often these were first built in the late 1800s, although many were updated / manned in WW2. The upside of this militarism to a peace-loving modern-day Canadian cyclist like myself? Endless great opportunities to get very high in beautiful, deserted surroundings. Above Pt. St. Bernard, etc. Today’s ride was to another old fort atop Mont Froid. This is one of many military installations around/above Lac du Mont Cenis. The border was moved in this region after WW2 (the French took the entire lake and beyond), but Mont Froid was a strategic placed French Fort and saw some action at the start and end of WW2, even changing hands twice in April 1945 just before the German retreat from the region. 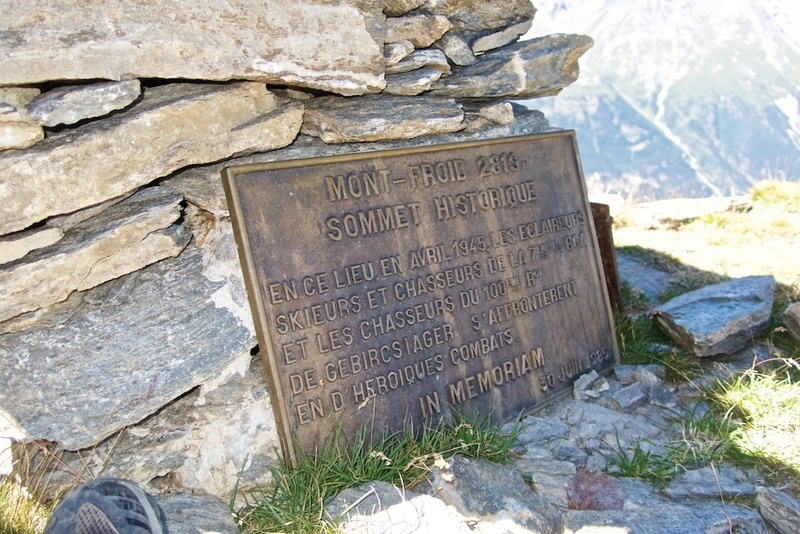 See photo of memorial plaque placed at 2819 metres lower down in this post. 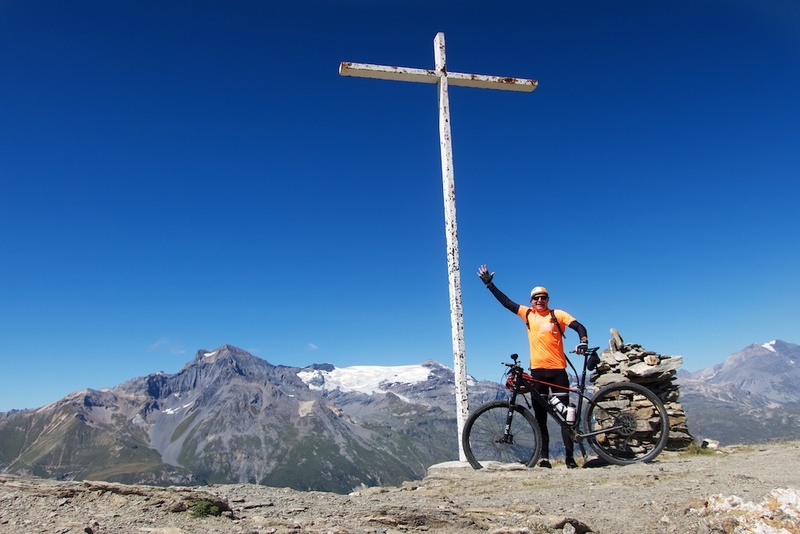 Starting from Termignon in the Haute-Maurienne, the route is gravel almost from the start. It’s full of hairpins, but of decent quality and rarely crazy steep. The climb is in a forest until above 2000 metres but even here and always above, I enjoyed fabulous views of the glacier across the valley. At roughly 2500 metres, the route enters a sort of cirque/amphitheatre. The road continues in a semi-circle high along one side. It’s crazy fun. 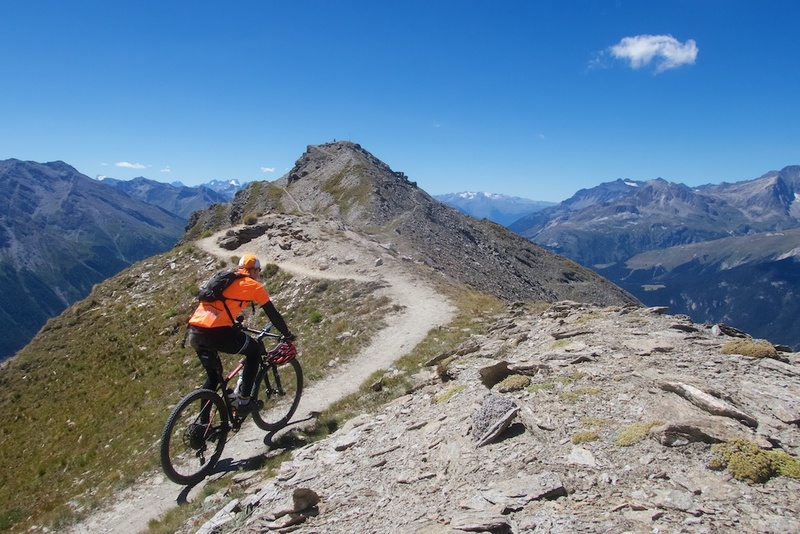 The route changes from a “road”, to a good quality, wide trail. But always rideable. At the far end is the highpoint at roughly 2820 metres with a giant cross, great views, and a small plaque commemorating the 1945 fighting here. I definitely did this ride in the correct direction the side I climbed was always rideable. 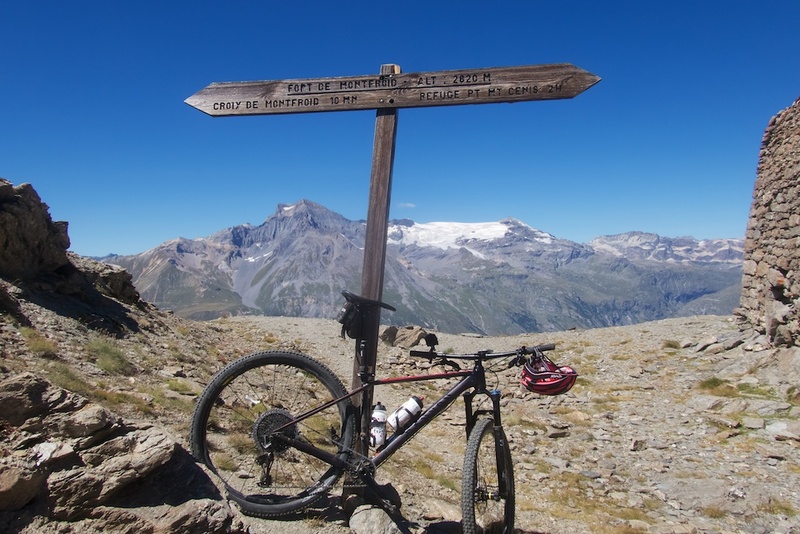 I double-backed and descended from Col de Sollières for several kilometres on trails that it would be hard to pedal up. 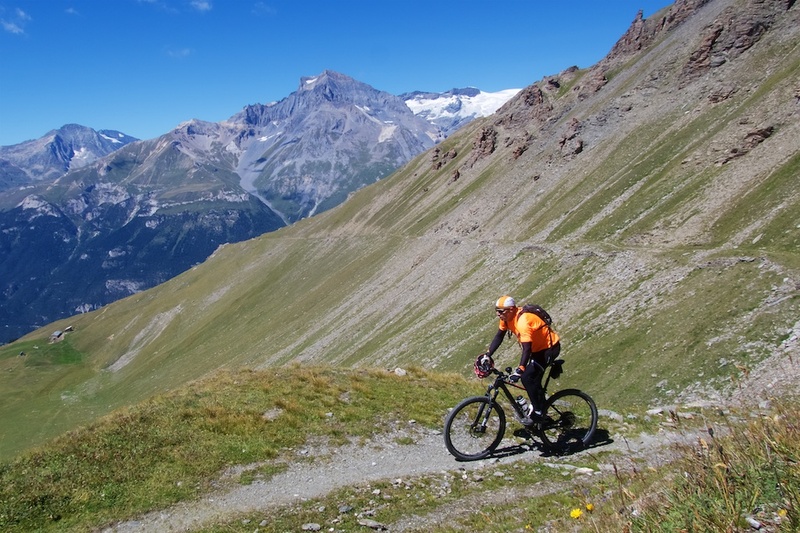 I eventually rejoined the paved road half way between Lac du Mont Cenis and Col du Petit Mont Cenis. As the map below shows, I did a short there/back to Petit Mont Cenis (the end of the paved road). 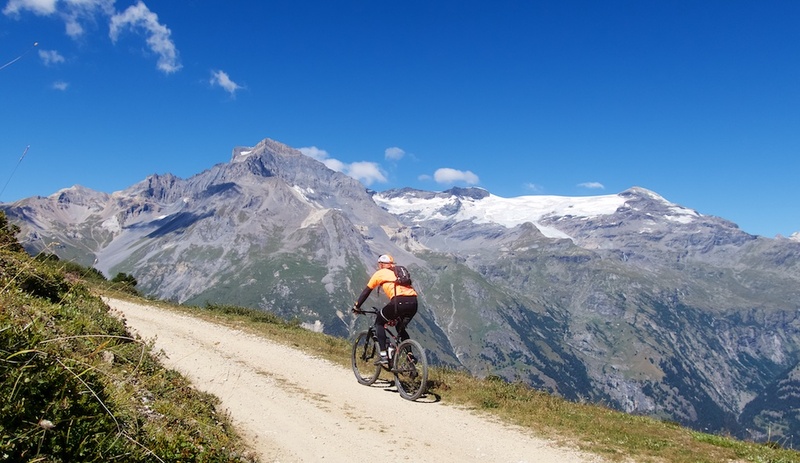 I highly recommend any road bikers climbing Col du mont Cenis to continue up this little side road to Petit Mont Cenis – 6 very scenic kilometres. 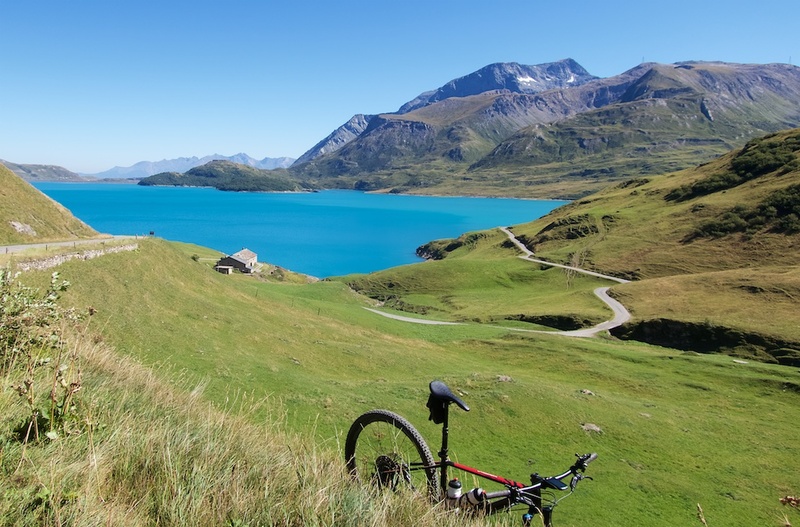 See here for a road bike ride of both the Italian and French sides of Mont Cenis including a detour to Petit Mont Cenis. 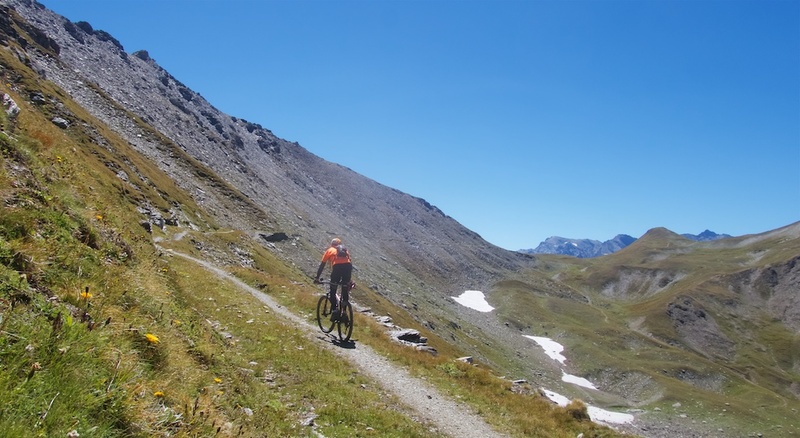 See here for a lessor known alternate road bike route from the Italian side. 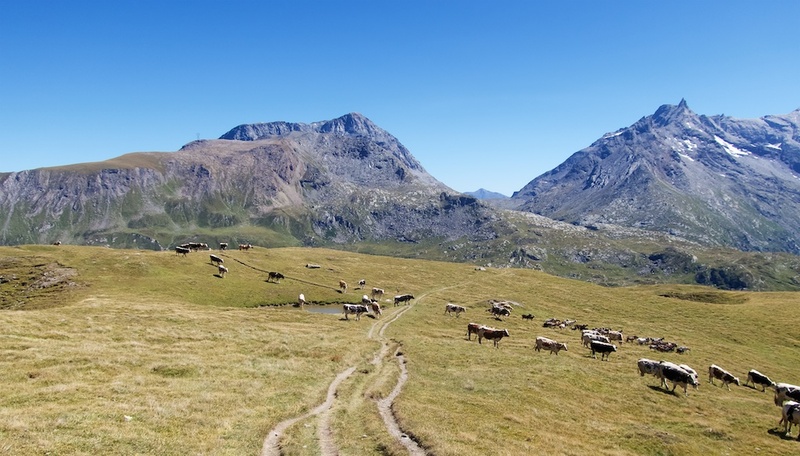 Road to Petit Mont Cenis at right. Main road to Italy at left. But the fun wasn’t over yet. 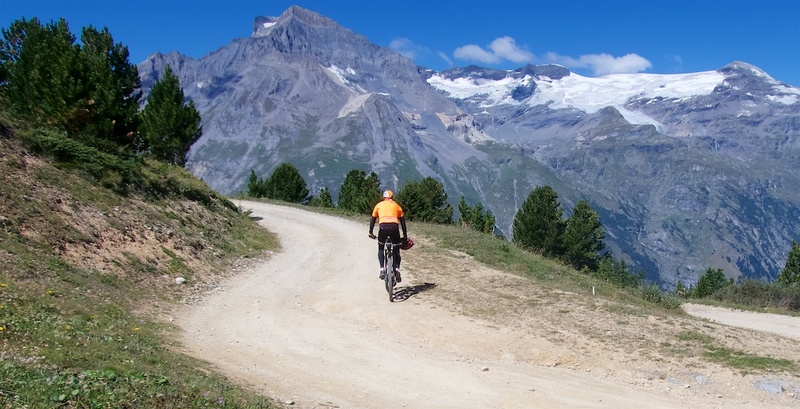 Instead of taking the paved road down, just below Col du Mont Cenis, I turned off onto an unpaved road. First quite difficult, but then flatter as it traversed to my early unpaved hairpins. This entire ride was near deserted, but I was struck by how many August tourists were along the paved stretches. Hikers, drivers, motorcycles. So this quiet alternate to the paved descent was an excellent choice. This is an amazing loop. A reminder of how much fun it can be to struggle up one of the many super-high, old, unpaved military roads in this region. We did this one too! Halfway the “theater” it gets more difficult with a heavy E-MTB. Nevertheless two crazy Italiens were there on their even heavier enduro motorbikes. 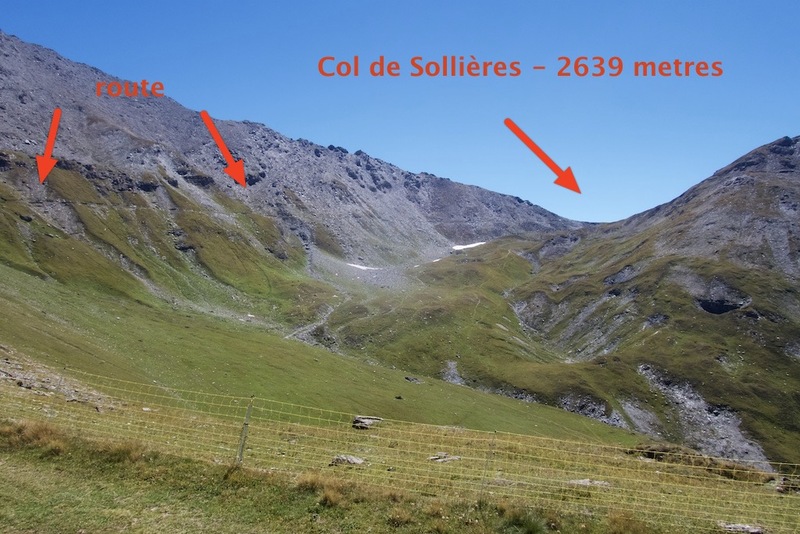 They didn’t feel comfortable going back so from Col de Sollieres they also took the hiking route down: a little crazy! Again thanks for this fantastic site! It brought us sheer pleasure!